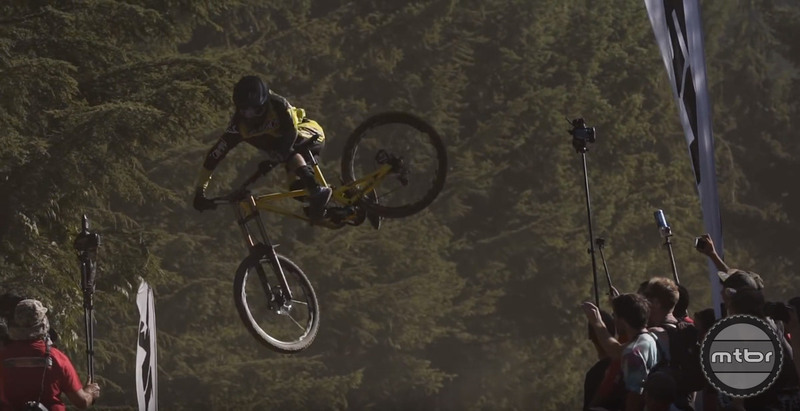 No one goes bigger at Whistler Bike Park than Remy Metailler. On any given day, more than a dozen mountain bike edits pass through our inboxes here at Mtbr. By and large, they’re terrible, like that time William Hung auditioned for American Idol. Instead of wasting your time by posting that crap, we try to sift for the nuggets. We know we’ve struck gold anytime the name Remy Metailler pops up. For those of you who aren’t familiar with the French madman, you should start your introductory course here. What makes Remy special isn’t the ability to nose manual or 360, it’s his absolutely insane ability to double (and sometimes triple) jumps and berms. If you’ve ever spent time riding the Whistler Bike Park, you will be absolutely humbled by his ability to link together huge lines. To get some insight into how he does it and why, check out the newest entry into the “Rubber Side Down” series. The latest episode follows Remy around his favorite lines and discusses his process for making the impossible look easy.